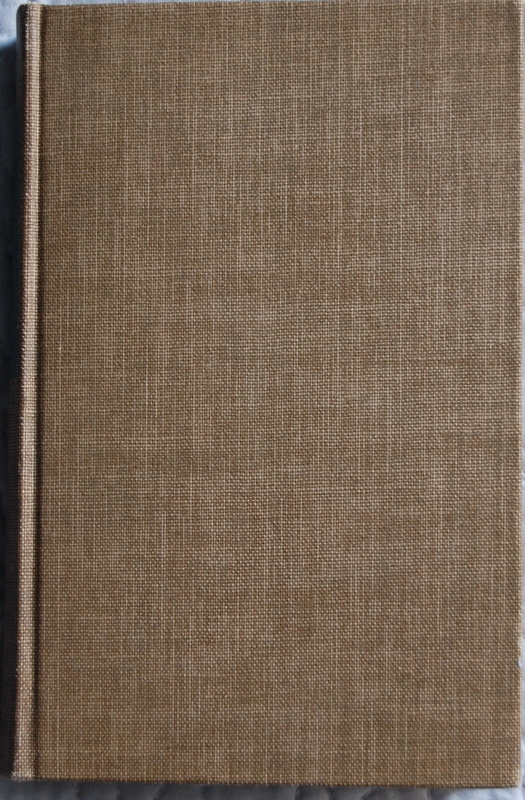 An Heritage Press exclusive, part of the Thomas Hardy collection. 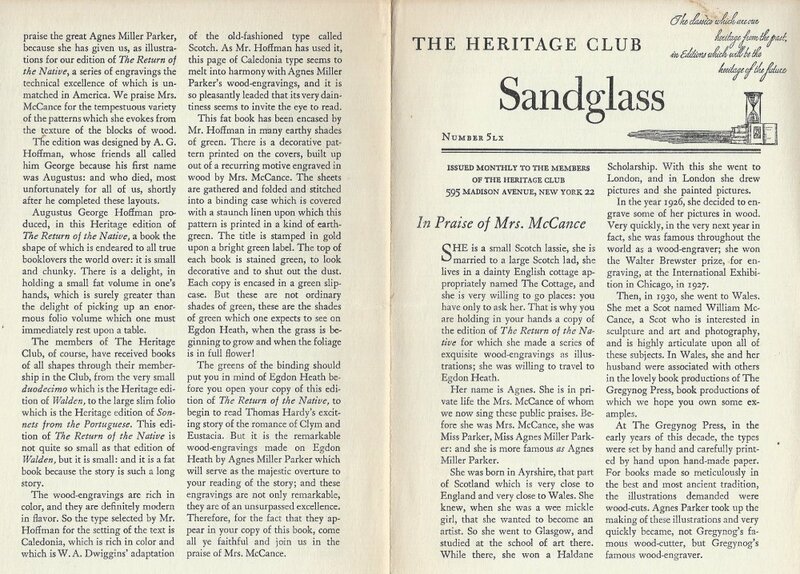 The Sandglass spends the first half of its length praising Agnes Miller Parker–and rightly so. 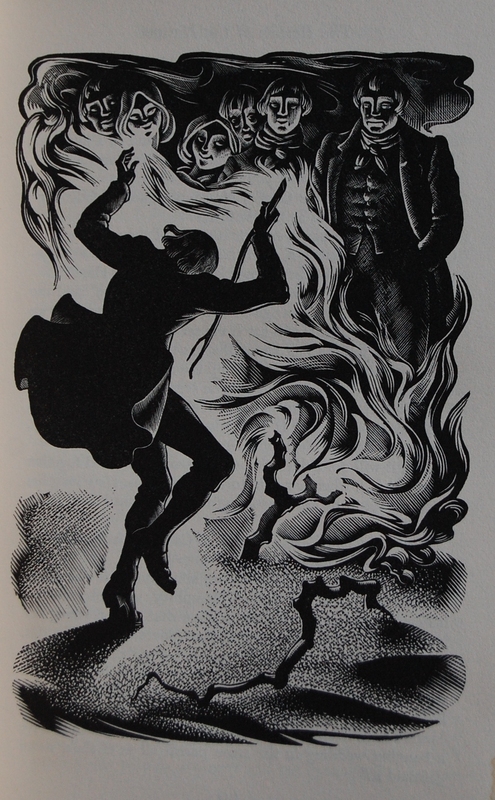 The Sandglass calls The Return the “best” of Hardy’s novels, because in addition to hardy’s usual pessimism and gloom, there is “romance and excitement”–two qualities caught amazingly in Parker’s wood engravings. 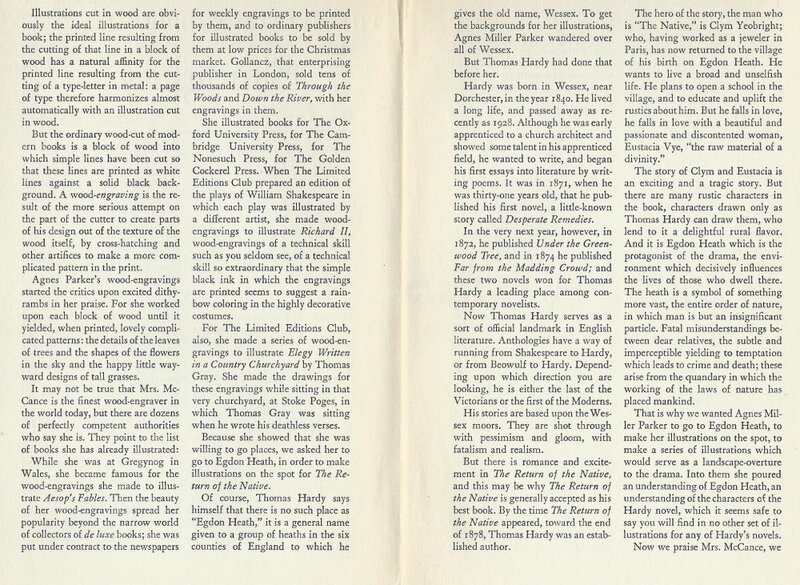 The book’s designer was A.G. Hoffman, who died after completing the layouts for this book. He chose Caledonian as the type–an adaptation by W.A. Dwiggins of the old Scotch font. The Sandglass says the page tops are dyed green, but my copy has green-speckled page edges all around. 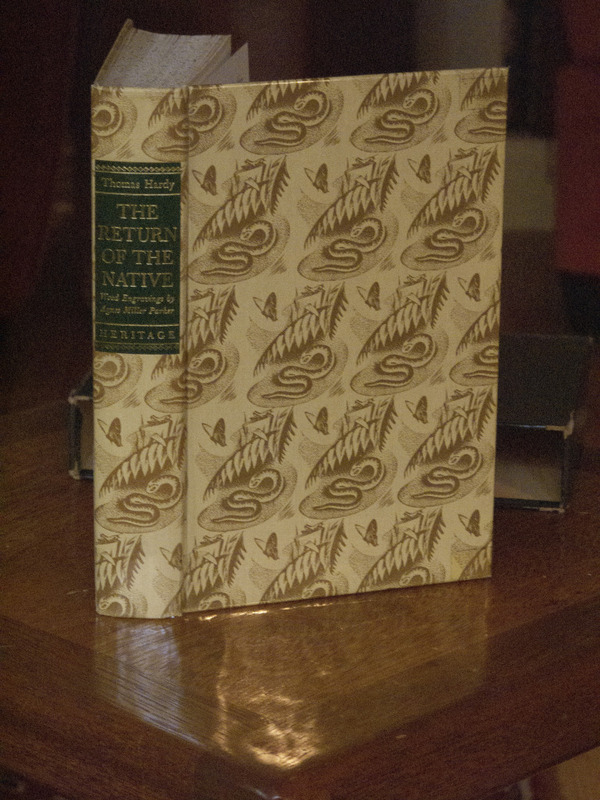 This is one example of the amazing variety of bindings in which a single title from the Heritage Press may be found. One could have a very interesting library by collecting all the variants! Neither of us know which version came first, so it’s one of those pleasant mysteries that make collecting these books so fun! It would seem World War II is the culprit in this book’s basic cover design – they had little choice in a time with heavy rationing. 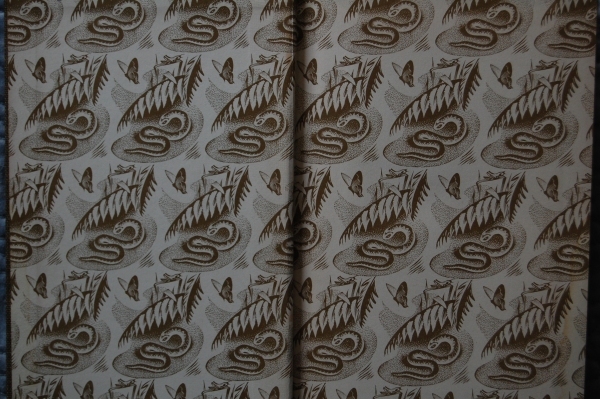 A.G. Hoffman was responsible for this book’s design according to the book’s final page detailing the book’s creation, as well (which isn’t a surprise, as I imagine the two are identical beyond the binding). Spine – The spine’s declaration of the book’s title is the same as the other two Hardy books I own – a block, boldly colored, with similar fonts, the declaration of Parker as its illustrator, and the Heritage brand at the bottom. 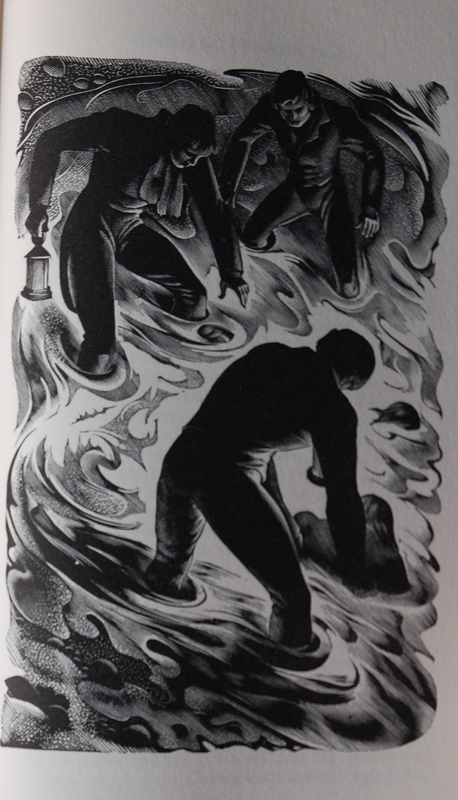 Title Page – Parker’s woodcut engravings are a great fit – she’s one of my favorites. The title page includes a quote from the text, I’m assuming. Page 380 – I apologize for the blurriness of this one, and will put up a replacement in the near future. Personal Notes – I can’t quite remember where I got this one, but I got it for cheap, I know that. I’d wager a library book sale. Parker’s exquisite art sold me more than anything else – it was water damaged on several pages (the art from Page 19 is one of those pages, but I cropped it to keep that stain out), and lacked a Sandglass or slipcase, and isn’t the most attractive book of theirs I’ve seen…but Parker did a great job with the engravings, and it served as my introduction to her work, which I’ve been collecting eagerly since. Haven’t read Hardy yet, so no comments on that side of things. It’s from ‘The Song of the Indian Maid’ by John Keats. Hardy would have expected many, perhaps most, of his readers to remember the poem (other Victorian authors quoted from it as well) but even if they didn’t, the lines would have given them a clue to the tone of the novel. Furthermore, the poem comes from Keats’s ‘Endymion’, a pastoral epic (nearly 4000 lines!) that like ‘The Return of the Native’ is about lovers’ meetings, partings, wanderings, misunderstandings and reunions as well as about love across class lines – though the class line in ‘Endymion’ is that between mortals and gods! Thanks for clarifying that for me. I had no clue! I am presently reading about the 2 different Heritage versions of this book …I may have the chance to own either one (the plain brown version has a slip case but no sandglass), and I am trying to decide which version is more desirable…any insight on that? I recently acquired a mint Heritage Press copy of “The Mayor…” – truly a lovely book. Well, I for one would want the Return of the Native with Parker’s distinct overlay for the boards, myself. The interiors would be the best way of gauging that, though. Look to see if the non-plain edition is from New York. If so, I’d suggest going that route if it doesn’t cost too much! I was able to find the non-plain version (with board overlay) and got it a few days ago…AMP has done some great work there, indeed! I am also the owner of Far From the Madding Crowd HP edition…. The Moon and Sixpence can be found rather easily on Ebay – for very affordable prices most of the time …. 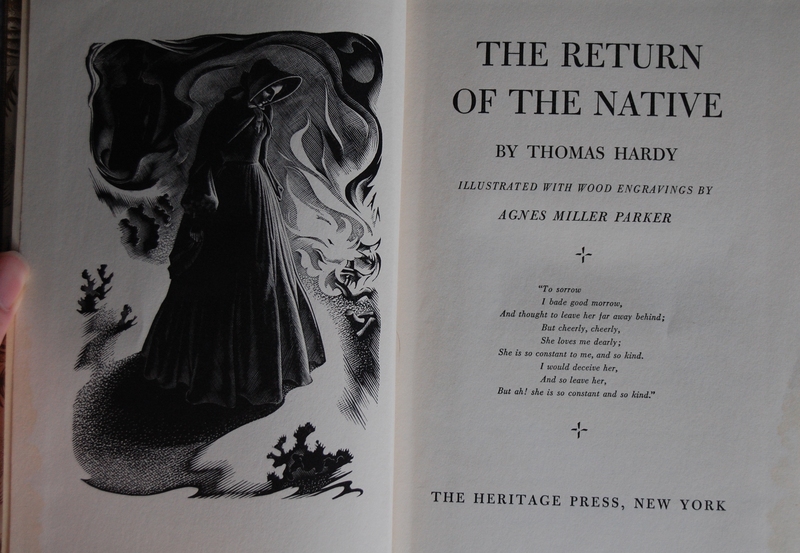 You are currently reading Heritage Press: The Return of the Native by Thomas Hardy (1942) at The George Macy Imagery.